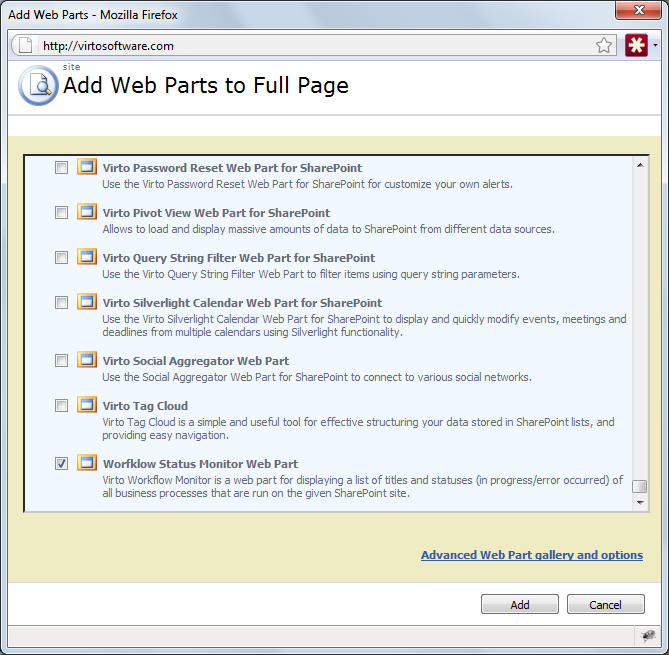 Go to SharePoint site where you want to add the Virto Workflow Status Monitor and open “Site Actions - Edit page”. You will switch to edit mode. Click “Add a Web Part”. Select Virto Workflow Status Monitor at the bottom of the list and click “Add”. Once you have clicked “Add” button, use “Exit edit mode” button. Added web part will be displayed on page. To adjust it, go to web part settings. In more recent versions of SharePoint choose “Edit” on the core page, then select “Insert” button on the ribbon and add “SharePoint Workflow Status Monitor” Web Part from the list.